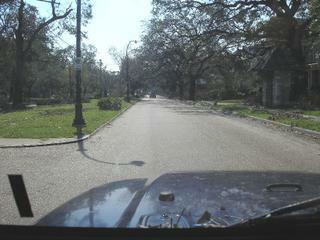 I spent nearly two hours driving throughout Uptown, the Garden District and the Lower Garden District. After finegling my way in (it took 30 minutes) to get past a checkpoint - they are only allowing in Federal or State Government officials - I immediately headed straight for St. Charles Ave. 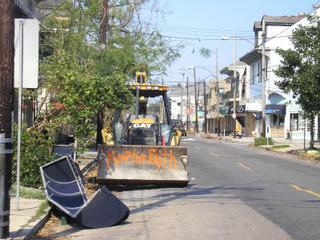 I expected to see similar damage as Jefferson parish except magnified by looting, ransacking and pillaging. Remarkably St. Charles is fairly clean. 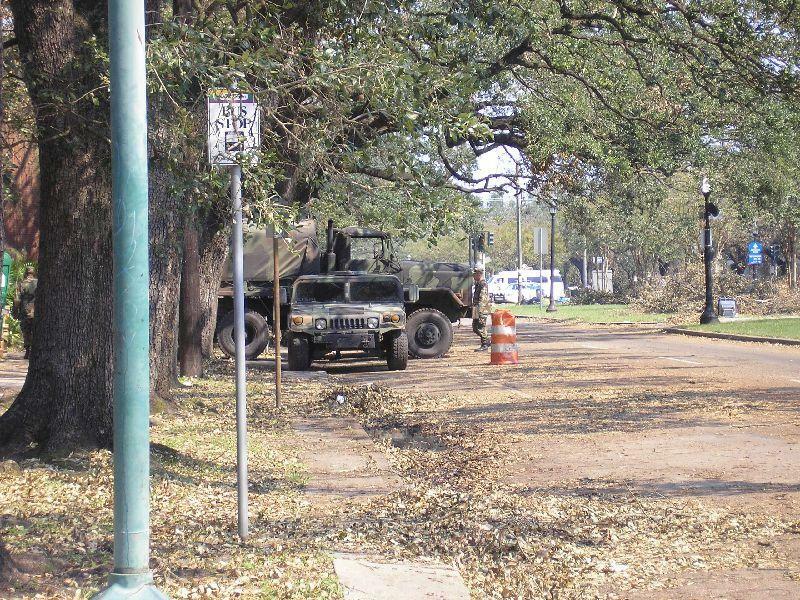 The Parish had obviously opened up the road, but it was weird, there are more trees down in Jeff. 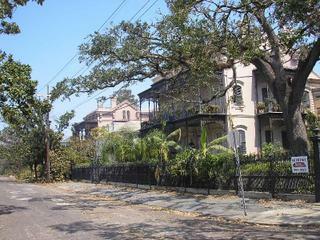 On St. Charles I saw NO evidence of the looting of homes. I turned off near De La Salle to check on a friends house (De La Salle and the JCC appear to be fine) expecting the worst... His typical Uptownie home was perfect. Not a shutter down and not a pane of glass broken. The only damage was a large tree which fell onto his shed. I next cruised up and down Magazine St. going as far as Jackson Ave. Again, remarkably, I was expecting to see the entire street looted... this was NOT the case. 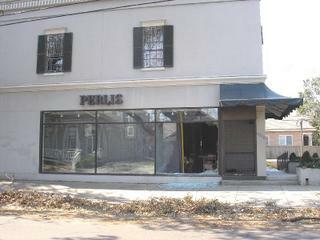 There were some signs of break-ins into shops, mainly shoe stores, clothing stores and Time Savers. The military presence is HIGH. There are large foot patrols eveywhere, countless suburbans cruising around with elite swat-like troops hanging off the doors, to unmarked unknown agency vehicles everywhere. In certain neighborhoods which can already appear to be carribbean in nature, they are thrust completely into this perception by M-16 armed, camoflauged soldiers patrolling seriously down streets off Magazine. 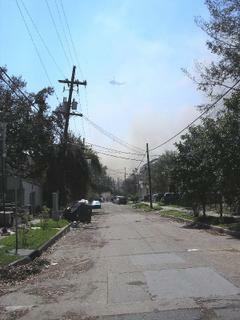 I next tracked straight into the Garden District where a fire was raging. Swarms of helicopters carrying large water buckets which are filled and refilled in the Mississippi River were passing overhead and discharging their contents on the blaze. 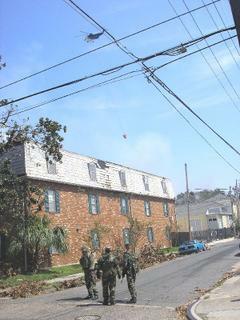 I was close enough that water dripped down on me from helos passing overhead. The security and press were high. Leaving and having other homes to check, I ventured down Jefferson Ave. only to be caught up by an ABC News crew who asked to interview me while checking on homes of my friends. I agreed and together we made it back over to Pitt St. and went inside a buddy's house. (I have a key). They interviewed me on the balconey and walking through talking mainly about the incredible condition of Uptown and the Garden District. 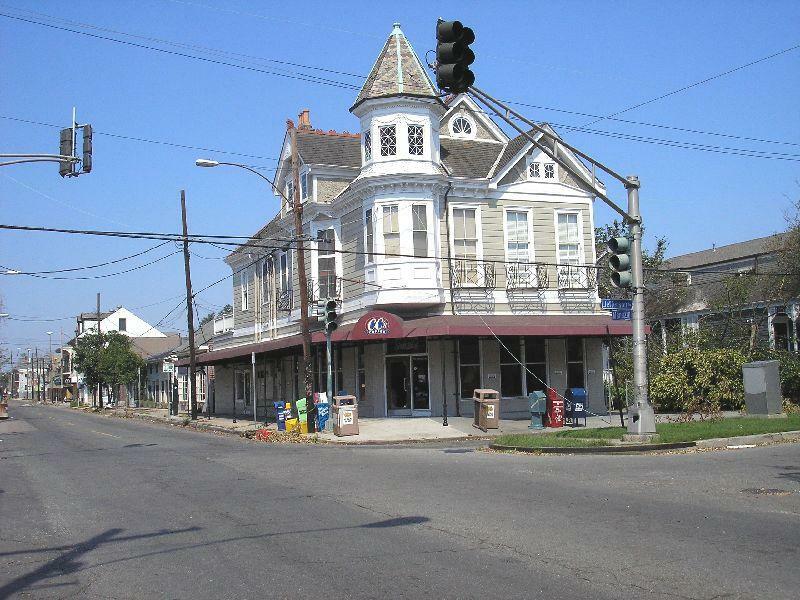 I explained that every neighborhood in New Orleans is historice, so that even if these two appeared to be ok, it doesn't mean that we've lost a hell of lot in neighborhoods such as Lakeview, Gentilly, the Bywater, etc. Afterwards I headed back to the Freret and Jefferson area... this is where the flood waters start. Basically anywhere from two to three blocks on the river side of Freret the waters begin and deepen. 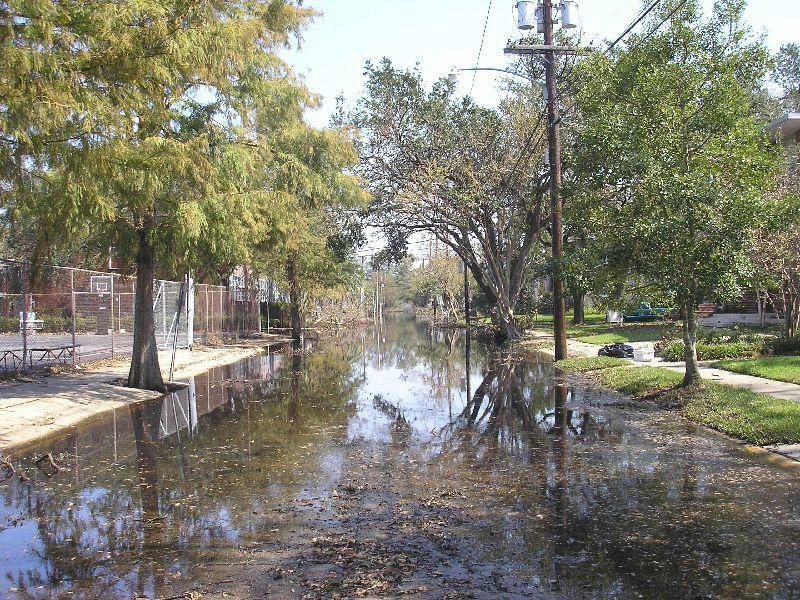 Trust me, that water is nasty - it ain't no typical New Orleans flood waters. 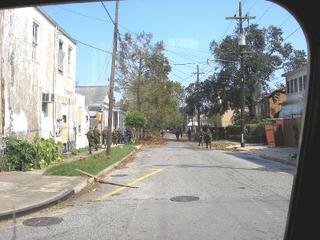 I tried again on Carrollton Ave. and was greeted by soldiers again at Freret. They asked me what my business was and all that rigamarole. The soldier while examining my ID, explained that there was a pocket of looting happening and that the troops were "taking care of it". He passed me through, but before I drove on , this soldier - probably only 18 - began apologizing to me. "I'm so sorry that we didn't get here sooner." I kept telling him to not be sorry, and thanked him over and over for being here now. Streets that I traveled on: State, Nashville, Prytania, Jefferon, Magazine, Jackson, Carrollton, Palmer, Calhoun, 1st, Camp, Napoleon, Broadway, and some minor side streets. All appeared the same. There was only one home that I saw which was caved in - probably termite infestation. Also, I saw NO evidence of cars broken into. My overall takeaway from this first foray into the city is that much of the looting in at least these residential areas is overblown. 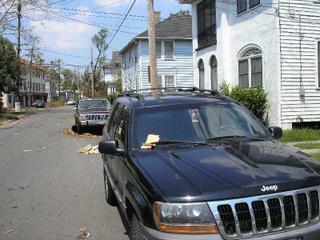 The actual hurricane damage is relegated to downed trees. There is effectively only light to moderate roof damage which is pretty much the same thing we've seen along the river in Jefferson Parish. Oh yeah, St. Joe's Bar looks like it could open tonight. Sorry about the quality of these photos... I had to dumb them down - I'm on dial-up. I do have hi-res copies of each though and the many more I haven't posted. Can you not get out there? Don't know if you have a wifi card, but T-Mobile is suppose to have free wifi in LA till the end of the month. All the best to you, and I hope that you stay safe and sane. I would love to hear more about what the future months have in store for you. You are my f-ing hero!!! How's my momma's house on State Street between South Robertson and Clara? Hey TAG. CNN is reporting that Naglin has officially ordered all people not working on the relief efforts will be removed forecably. Hi. I only caught the end of an ABC report tonight. Was that you standing on the balcony of a house, playing the harmonica? Stay safe - we are praying for you. I just found your blog on a link from Interdictor. Good pics and good information. I admire your courage and good spirits. But we are never surprised at good spirits from NO people. Best wishes from the boring end of the state. 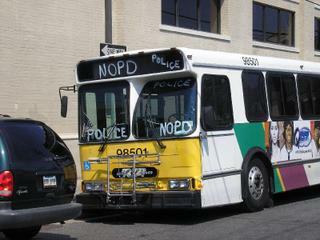 Ray Nagin orders mandatory evac now???? Well the difference is you will be forceably removed. The disease threat has gottne pretty bad. lol... no I don't play the harmonica unless they CG'ed it in. I'll be the guy wearing a red Mt. Gay Rum sailing hat. It says Lake Pontchartrain Racing Circuit. Good luck, TAG. There's been little, if any, news from your area, and it's been appreciated. I deeply respect your commitment and your ability to keep it all together. 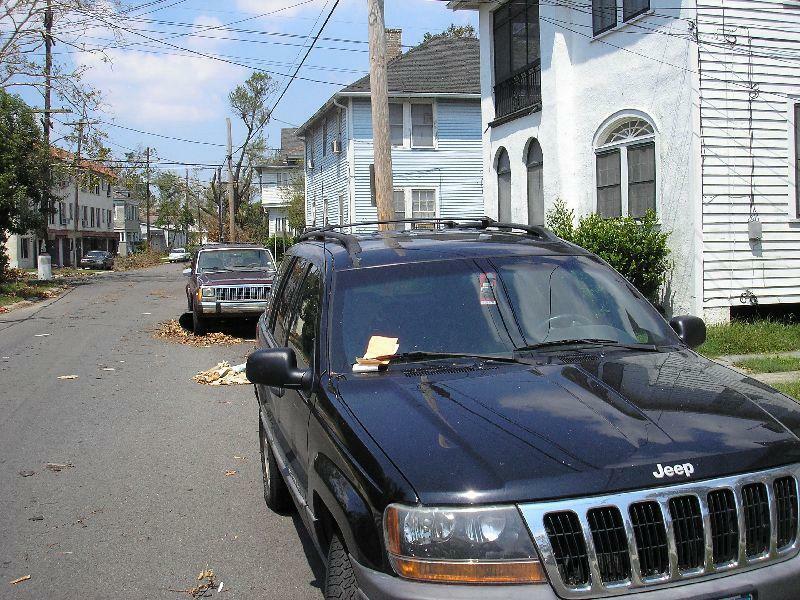 Another online resource you might find useful is the Katrina Wiki, http://wiki.nola-intel.org/index.php/Main_Page. It is good to see the progress, you're documenting. Damn impressive effort by all involved. I posted your photos on Daily Kos, which is one of the most widely read blogs in left blogistan, so that evacuees checking this site might be able to see their homes. Good luck and I hope you can continue to stay in New Orleans -- this mandatory evac order is worrisome, because it isn't clear whether there is a plan to get people back. Thanks for your help. 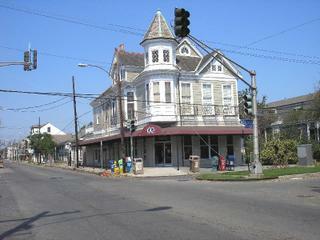 How deep do you suppose Joseph St between Freret and S. Robertson got, and did you happen do drive down it? Thank so much, I live uptown on Millaudon Street and due to the military, I was not able to see the salliate images as they have block out the pictures. I need some peace of mind. TAG - Thanks for the pics and info. 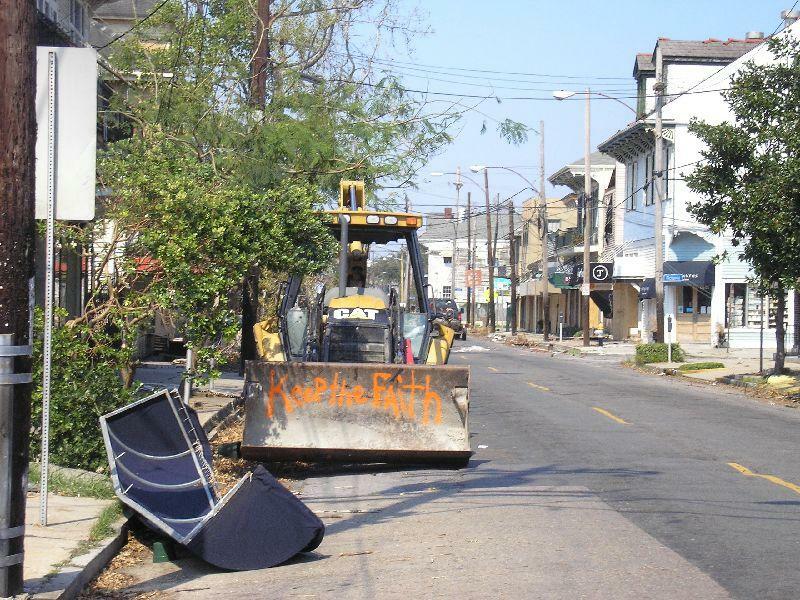 I, like most Uptown/Garden District-ites, are itching to get back, roll up our sleeves and start sweatin' to put it all back together again. Keep up the good work, and be safe. Are the troops aware of any info about us returning, even to pick up stuff? If any info, feel free to email at emee34@hotmail.com, so I can pass it along to my peeps. Thanx. Companies Have Already Started Firing!